Ford is capitalizing on its impressive sales momentum (sales year-on-year is up 25 percent) by introducing two new variants to its most popular nameplates: the EcoSport and the Everest. The best-selling Ford nameplate ever, the EcoSport gets a new limited edition trim that goes above the range-topping Titanium model. 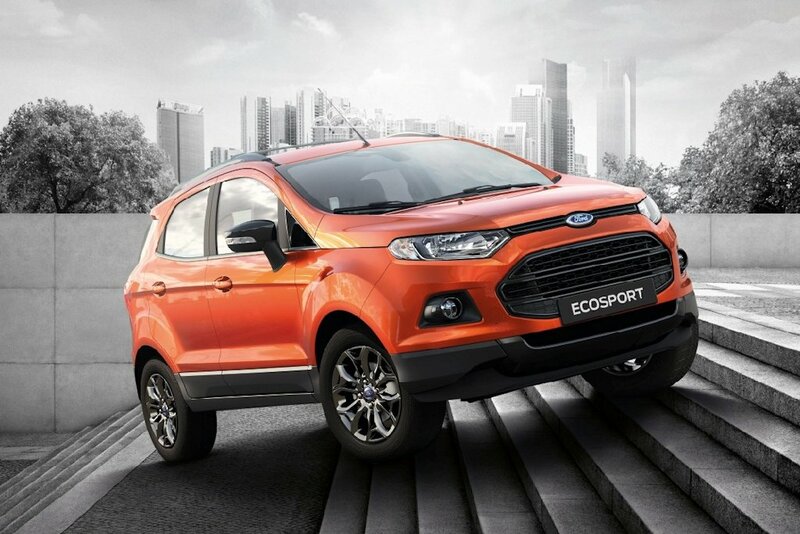 Dubbed the EcoSport Black Edition, this sub-compact crossover swaps some of its high-gloss silver trim pieces for black ones including the front upper and lower grille as well as the 16-inch alloy wheels. The side mirrors are also decked in a high-gloss black finish as well. The more rugged appearance package is completed by the cross bar roof rails. Inside, the well-appointed Black Edition gets more piano black accents as well as aluminum sports pedals and an aluminum scuff plate. It’s mechanically unchanged so it’s still powered by a 1.5-liter Ti-VCT 4-cylinder engine mated to a 6-speed dual clutch transmission. 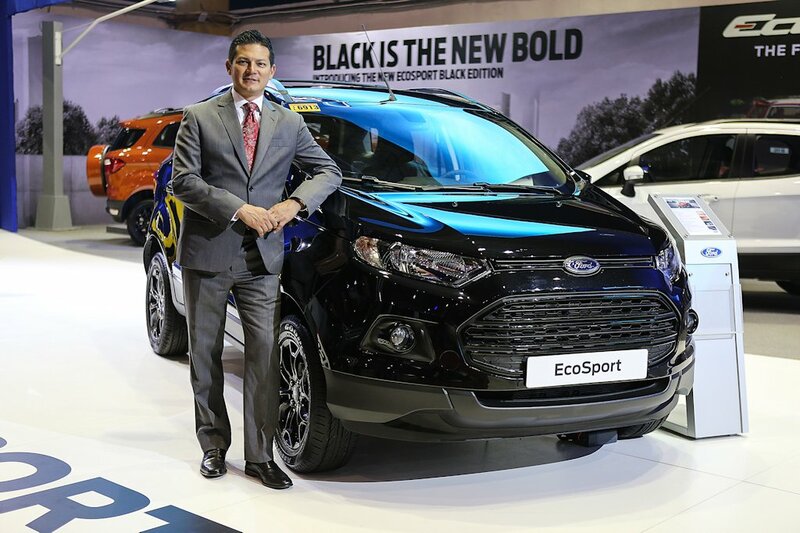 Available for pre-orders, the EcoSport Black Edition will head to Ford showrooms by around June of this year. The price of differentiation doesn’t seem to carry a huge penalty as the Black Edition carries a premium of just P 23,000 (P 998,000) over the range-topping Titanium on which it’s based on. 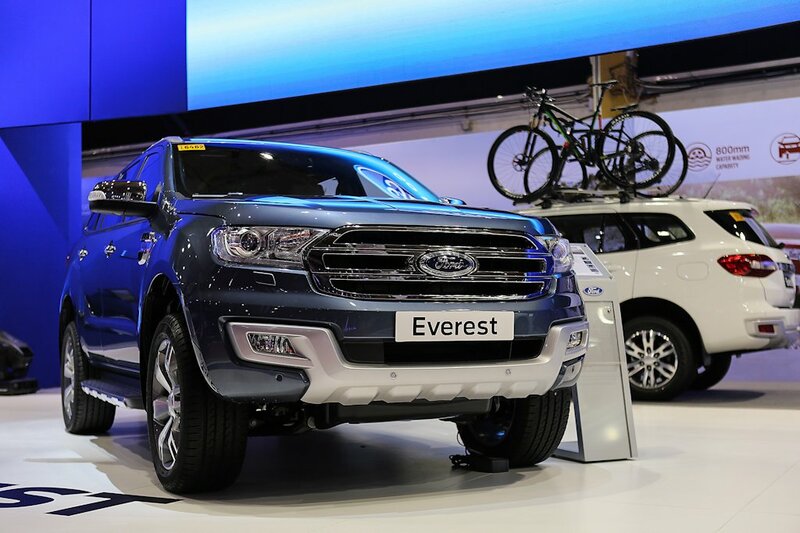 On the other side of the spectrum, Ford also announced a new variant in the country’s most popular mid-sized SUV: the Everest. Able to outsell its Japanese (and other American competition) the Everest is joined by a new Titanium 2.2 4x2 A/T Premium variant. Representing the top-of-the-line variant of its brisk-selling 4x2 line, the Titanium 2.2 4x2 A/T carries with it all the features of the 3.2L 4x4 A/T Premium variant without the 3.2-liter engine or the 4x4 transfer case. Features such as the 20-inch alloy rims, automatic headlights, rain-sensing wipers, blind spot indicators and more are joined by the HID projector headlights with washers, 8-way power adjustable front seats, and a 50/50 power folding third row. 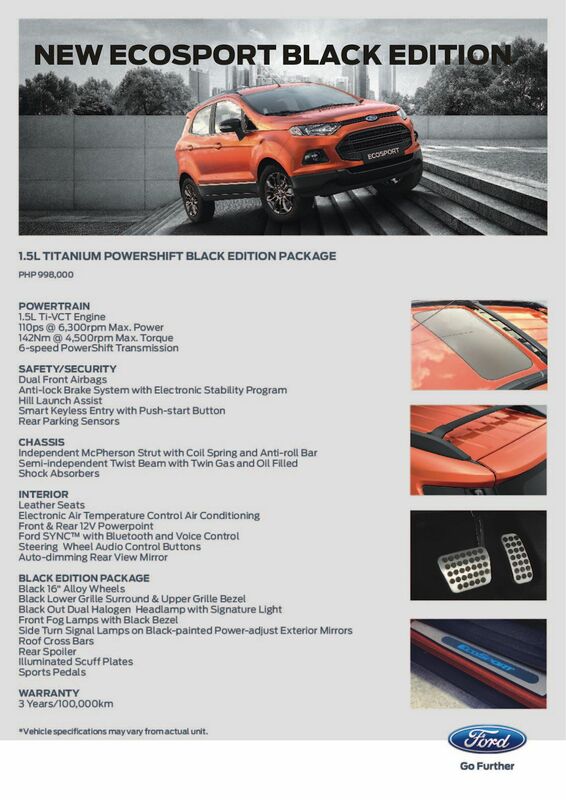 Powered by the same 160-horsepower 2.2-liter 4-cylinder Duratorq diesel engine, the Titanium 2.2 4x2 A/T Premium retails for P 1,799,000 and is now available at all Ford dealerships nationwide. Can you include the prices of the other models in the specs brochure? And it would have been ever greater if Ford had a tarp at their MIAS booth which says: "We continue to strive to give our customers a world-class after-sales service at all our service centers nationwide!" i need some inputs from you guys since i am planning to buy my first ever owned car. 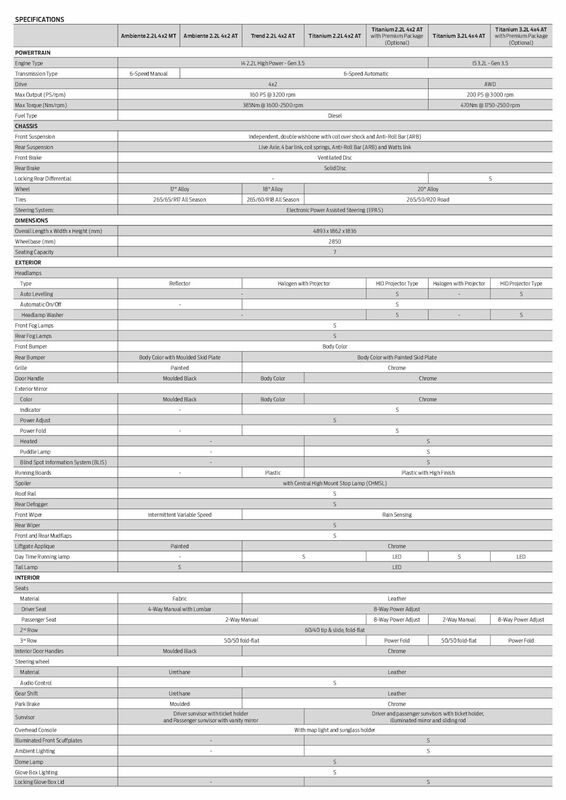 I am trying to compare hrv, asx, cx5 for crossover/suv with their over all specs and usage. I am also considering the new Hilux (i knw lots of you don't like it due to the price but I always travel a lot in province and make use of it while i am there). Sir Uly, help me pls? Okay, I think you pretty much answered your own question here. If you do plan to use it regularly for trips to provinces and those trips entail some rough roads, I suggest to go for a PPV such as the Fortuner, mu-X, or Everest. Given their pricing, you can opt for a mid-grade model with a 4x2 drivetrain. That being said, if you're to eliminate rough roads, between the choices, I'd like the CX-5 as my top pick followed by the HR-V and finally the ASX. If you're going for the CX-5, opt for the mid-grade 2.0 Pro. That's the best valued one in the line up. please report to the LTO black ford ranger with plate number ABI-5673. No License at the rear. Hindi bah pdng 4WD to? sayang yung High Ground clearance nya. I wish Ford Philippines would also give us the diesel variant like they got in India.